This is one authentic South indian breakfast which has the goodness of ragi/finger millet flour combined with rice flour and pressed using a press to make thin noodles. It is then steamed and can be served with various sides. We made it simple and had it with some fresh shredded coconut and sugar. It goes well with vegetable stew or made as a savoury sevai. This is the recipe I used.. Mix the rice flour, ragi flour and the salt together. Add the boiling water slowly and mix with a spoon. Keep it covered for about 3 to four minutes. Once it has cooled enough to be handled with the hands, knead to form a thick dough. Slightly grease the idiyappam press and the steamer/ idly moulds. Using the idiyappam press, make thin rice noodles on the idly moulds. Steam using the pressure cooker without the whistle or whatever methods you generally use for steaming. Steam for about 10 to 15 minutes. Allow it to cool slightly and transfer to plates. Serve with whatever condiments you like! I'm Popeye the sailor man!!! I got several interesting answers for the guessing game yesterday! Wash the spinach thoroughly. Chop the bananas roughly. Add all the ingredients to the blender/juicer and pulse till you get a smooth smoothie! The banana masks the raw taste of spinach. If the banana is not ripe enough you could add a spoon of honey/ agave nectar for more sweetness. I did not add it though. This smoothie contains the goodness of the superfoods - spinach, oats and banana and has a good serving of fruits n veggies. What more could one ask for! There was no compromise in the taste aspect as well. Do try this and get hooked on to its taste! Also do check out my other smoothies! This is the breakfast smoothie I had for my breakfast today! It was so so delicious! Guess what are the ingredients in it??? It has exactly four ingredients in it..
Will post the answer tomorrow! It is the time to Taste and Create again! This month I was paired with Nicole of For the Love of Food. She has an amazing blog with recipes from various cuisines. Her photographs are really amazing! I had a variety of recipes to choose from from which I made these delicious bean burritos. However, I used a few store brought ingredients for the burrito instead of making my own refried beans. I made a few additions to the recipe. I added guacamole and a dollop of sour cream.The burrito tasted much like the seven-layer burrito from Taco Bell! To prepare the spanish rice, cook the basmati rice with 1 cup of water until nice and fluffy. Add the hot sauce to the cooked rice and mix well until evenly coated. What a quick way to make spanish rice! Warm the tortillas on both sides by heating on a skillet. 1. Layer refried beans down the middle of the tortilla – don’t use too much or it won’t roll! Stay at least 3 inches away from the ends. 2. Sprinkle some cheese over the beans. 3. Cover the beans/cheese with rice. b. Fold the part closest to you over the middle, there will be 2 little “wings” sticking out, fold those in, and tuck the large flap under the beans as well as possible. c. Fold the top flap towards you making sure to fold in the little “wings” and tucking below the burrito. 5. Top with salsa, lettuce, and any other topping you desire. Some enchilada sauce would also be nice! I know this is a weird combination for a rice. But this was really so delicious and packed with nutrients. This combination was born as a result of cleaning out my fridge. I had a pack of frozen lima beans or fava beans lying around for a long time. I was in a hurry to prepare something for our lunchboxes. So I was planning on making a one pot meal with rice. I used fresh methi leaves from my garden for this recipe. It could be replaced with any greens or herbs. The fresh methi leaves along with the lima beans when cooked with aromatic basmati rice resulted in this wonderful combo! We had it with some cucumber raita and chips! Wash and soak the basmati rice for 20 to 30 minutes. In a pressure cooker, add the oil or ghee and fry the onions until translucent. Add the ginger garlic paste and green chilies and fry for a minute. Then add the tomato and salt. Once it turns mushy. add the frozen lima beans and chopped fresh methi leaves and give it a stir. Add the garam masala and the turmeric powder and saute for about two minues. Add the soaked and drained basmati rice and saute again. Add about 3.5 to 4 cups of water and pressure cook until 3 whistles. Garnish with coriander leaves. Serve warm with raita and chips. Great for lunchboxes! Also sending this to Grow Your Own hosted by Nate and Annie and started by Andrea. I am here with the next edition of Show Me Your.. series. After enjoying all those festive foods, it is the time of the year to eat healthy with all the new year resolutions coming in. Salads are a great way to include fresh vegetables, fruits and greens in a normal diet. They are easy to put together and requires minimum preparation time. Anything and everything can go into a salad and it tastes great with a simple dressing. So get ready to toss your salads. Here are some guidelines for the event. 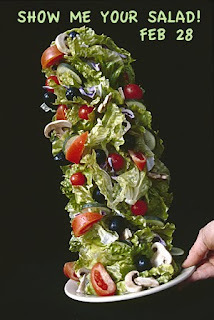 Prepare your salad and post it on your blog. You could send any number of entries. Try to keep the salads as healthy as possible. You could include any type of fruits, vegetables and grains in the salad. Non-vegetarian salads are also allowed. You could also give the recipe of the dressing you used if you like. Please link back all entries to the announcement post. Archived entries are allowed but you need to repost them and also link back to the announcement. Send me an email to divyablogs[AT]gmail[DOT]com by February 28th with the following details. Feel free to use the logo. non-bloggers can email me your entries. Also do check my previous editions of the event. I will be posting the roundup of Show Me Your Cake shortly. Yes! 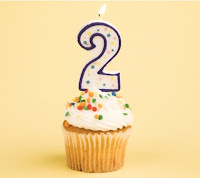 I am really happy to say that my blog has turned two! Time flies! Thanks to my dear husband who is a good critic and gives feedback on all my cooking and waits patiently to eat until I photograph all my cooking! I also thank all the bloggers out there for encouraging me with your valuable time and comments. For this month's Indian Cooking Challenge Srivalli chose Moong Dal Halwa. I was skeptical in the beginning as I have never ventured making halwas of any kind and have never eaten any halwa made with dal. I however gathered up the courage and prepared this delicious halwa according to Simran and Lata's recipe. I especially loved the color of the halwa. Since I did not have kova, I tried the second recipe suggested. Here is the recipe as given by Valli. Use a thick bottom pan or better nonstick pan. Don't leave the halwa unattended. The dal can stick and it can go from just done to burnt in a second so keep stirring as much as possible. You should remember to keep stirring to prevent dhal from sticking irrespective of the ghee added. You aren't looking for the halwa to get too thick when you turn off the heat. It was thicken as it cools. In both recipes depending on how you got the moong dal paste, you may require slightly more ghee to get the texture. Looking back, sakkarai pongal (sweet pongal) was the first post in this blog! That was my thalai pongal and I had hardly learnt to cook! It was the first time I made pongal and it turned out quite okay!! The above picture was taken this morning - Pongal 2010! Delicious pongal recipe from my mom! Wash the rice and dal. In a pressure cooker, add the rice and dal together along with 3 cups of water and 1 cup of milk and pressure cook until the rice and dal is fully cooked and turns mushy. Powder the jaggery finely. Add the jaggery and cardamom powder to the rice-dal mixture. Stir it thoroughly. The jaggery melts in the heat and gets incorporated well. In another saucepan roast the cashews and raisins in the ghee until the cashews turn golden brown and the raisins plump up. Garnish the pongal with the roasted cashews and raisins! Sending this to The repost event hosted by Desi Soccer Mom. Also do check out my non-food blog here! I had a couple of sweet potatoes lying around for a while after making sweet potato fries waiting to be used up. It was soup night! Yeah I have been trying to make healthy soups for dinner atleast once a week. I googled for recipes with sweet potato and found several methods. I decided to roast the sweet potatoes because I feel that roasting enhances the flavor of the veggies. Check out my Roasted Tomato and Beet soup ! This soup tasted very similar to my pumpkin-zucchini spaghetti soup I tried in the fall. I added carrots because I wanted to finish it up. It resulted in a colorful, hearty and filling soup which was perfect for a chilly evening..
Peel the sweet potato and dice them roughly. Also dice the carrots. Spread the carrots and sweet potato in a single layer on a baking sheet. In another baking sheet , toss halved tomatoes in the vinegar and olive oil. Roast the sweet potatoes, carrots and tomatoes in the oven for about 25-30 minutes. Once it has cooled a bit, collect all the ingredients from the baking sheets including the juices from the tomatoes. In a heavy bottomed pan, heat the butter and add chopped garlic. Saute for a while and then add chopped onions and saute until translucent. At this point you could also add chopped celery. Add all the roasted vegetables (sweet potatoes, tomatoes and carrots). Saute for a minute. Add stock/water enough to cover all the veggies. Also stir in the basil/thyme. Add salt and bring it to a boil. Simmer for about 20 minutes until all the flavors blend through. Once the soup has cooled a bit, blend all the contents in a blender/mixie. Bring the soup back to the pan and heat it up just before serving. Garnish with some parmesan cheese and some red chilli flakes. Serve with some warm bread! Sending this to Monthly Mingle:Winter Vegetables and Fruits hosted at Cook Like a Bong and started by Meeta. This is sure a healthy and nutritious soup which I made last week for our dinner. It has a lovely deep red color from the beets. I roasted the veggies in the oven to give more flavor to the soup. We had it with a piece of bread and it made a filling and nutritious meal. The recipe can be tweaked according to the ingredients available. The soup looks really pretty and the photos do not do justice to the recipe as they were taken in a hurry at night before our dinner. Dice the carrots, tomatoes and beetroot into cubes of equal size. Spread in a single layer in a baking dish and sprinkle with garlic salt and dry herbs and bake for about 30 minutes. You could absolutely skip this step by roasting the veggies in a stovetop on medium heat with a teaspoon of oil until the veggies turn crispy and slightly cooked. In a heavy bottomed vessel, heat the oil and add the bay leaf, chopped garlic and onions and saute for two minutes. Add the roasted vegetables, chilli powder, salt and pepper and saute for a while. Add enough vegetable stock or water and bring it to a boil. Simmer for about 15 minutes. Allow the entire mixture to cool. Remove the bay leaf and blend using a hand blender or in a mixer/blender to form a smooth liquid. Take care while blending. If the mixture is hot, it might burst on you. Bring the soup back to the stove in a heavy bottomed vessel. Once it heats up, adjust salt and ladle into soup bowls. Garnish with some red chilli flakes and some parmesan cheese. Dont forget to send in your entries for Show Me Your Cake event by Jan 15th! I remember having this poriyal often at home since we had a drumstick tree back at home. Drumsticks used to find its place in several dishes and we almost got tired of having it so often. Here I hardly find fresh drumsticks. During our trip to the Indian store, I found a bunch of fresh drumstick leaves and without thinking what I would be making with it, it just landed in our shopping cart. I got this recipe from amma and made it the next day. And we really liked it. We had it with dal, rice and some papads. Makes a wholesome, nutritious meal! Wash and remove the drumstick leaves from the stalk. Soak the split moong dal in water for a few minutes so that it cooks quickly. In a skillet, add the oil and do the tempering with mustard seed, urad dhal and curry leaves. Add the chopped onions and green chillies and saute for a minute. Add the washed drumstick leaves, salt and soaked moong dal. Cover and cook for a minute. Do not allow the leaves to get mushy. Finally add the grated coconut and mix well. Remove from heat. Happy New Year to everyone. I am here after the holidays and after a short break. Hope all had a great Christmas and New Year vacation. I baked these savoury cookies during the holidays after having loads of sweets and cakes. This is an Indianized version with all the masalas. The recipe could be easily tweaked and modified to suit ones tastes. I wanted to make something along with tea and was in no mood of elaborate cooking. I had very little time and I baked these delicious cookies in about half an hour from start to finish! In a mixing bowl add all the ingredients except coriander leaves and egg and mix together. Add in the egg and coriander leaves and sprinkle very little water and knead to form a soft cookie dough. Line a cookie sheet with parchment paper. Shape the dough into small balls and flatten them slightly. Bake for about 13 to 15 minutes. Cool the cookies in a wire rack and store in airtight containers.